A celebration named “Waterfront Putuo” was launched in the Global Harbor Mall on Tuesday to boast Putuo’s abundant tourism and shopping resources. The Global Harbor towers are illuminated to celebrate the shopping festival. AS part of the annual Shanghai Tourism Festival, a celebration named “Waterfront Putuo” was launched in the Global Harbor Mall on Tuesday to boast Putuo’s abundant tourism and shopping resources. The celebration, which runs through all of October, incorporates the major tourism attractions, hotels and cultural venues in downtown Putuo District with evening gala, innovative markets and a series of other events. “The celebration aims to showcase the image of Putuo, highlight the beautiful scenery along the Suzhou Creek and drive the development of the district’s tourism industry,” said Zhou Jinfeng, the Party secretary of the Putuo tourism bureau. The fourth year of the tourism and shopping celebration is themed on “eat, play, shop and show off” with new experiences to attract both tourists and locals. Pop group Vocal Force and a new idol music team ACEMAX-RED performed at the opening ceremony at the south plaza of the Global Harbor, the largest shopping mall in downtown Shanghai. During the event, the M50 university students’ entrepreneur market will make its debut, where the young business wannabes showcase traditional handicrafts and interact with tourists. The major attractions in Putuo will offer discounts on the admission tickets during the festival to entice customers. At the Changfeng Ecologic Business Zone, along the Suzhou Creek, visitors can tour around the newly opened white whale and art aquariums at the Changfeng Ocean World or let their children be inspired at the Legoland Discovery Center. A series of events, including a children’s painting competition about the Suzhou Creek and a domino exhibition will be held at the Bailian Zhonghuan Commerce Plaza to further promote tourism resources along the creek. A batch of patriotism activities have also been planned for children. The Legoland Discovery Center, for instance, will organize children to build up China’s national flag with Lego bricks at the Joy City Mall. Classic patriotism stage dramas will be held at the Red Star Macalline Experience Center. The Shanghai Textiles Museum, on the south bank of the creek, will hold an exhibition about the traditional Chinese clothing of the Zhuang Minority. One of this year’s highlights is a shopping festival, which will run until October 8. A large number of local gourmets have been rushing to the Global Harbor Mall where around 50 local eateries have opened temporary stalls together. The “food carnival” allows residents to taste most of the local wanghong restaurants, or “web celebrity restaurants,” at a single site without waiting for hours, said Luo Gaofei, vice director of the district’s commerce commission. The selected eateries include the renowned Ada Scallion Pancake and Menghua Street Wonton that usually attracts large queues and often requires hours of waiting at their flagship eateries. The food stalls open from 4pm till 10pm between Friday and September 17 on the fifth-floor rooftop garden of the Global Harbor Mall on Zhongshan Road N.
The food carnival “taste in our childhood” aims to gather the most authentic, popular and classic local flavors for city gourmets, said Ye Kai, general manager of the mall. “All the food must be cooked on site to ensure the freshness and food safety,” Ye said. The district’s food and drug watchdog and the management of the mall will ensure all the selected eateries have essential certificates and a business license. Commerce has become the second pillar industry of Putuo, whose shopping sales rank first among all the downtown districts. 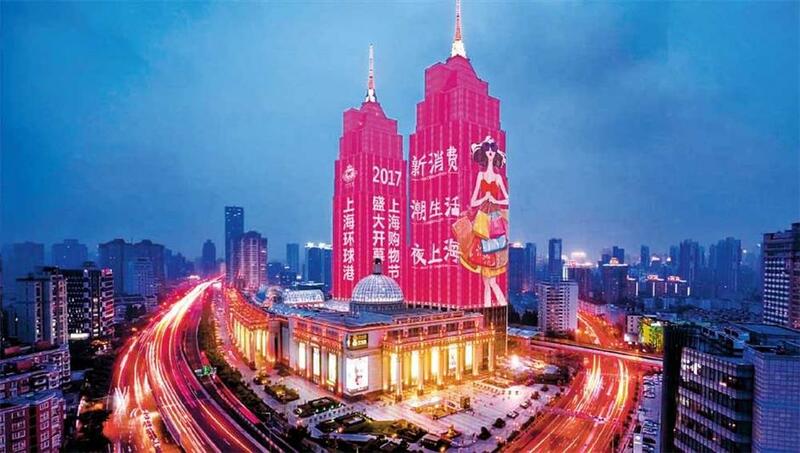 The district government spares no effort to help achieve the city government’s ambition to develop Shanghai into an international consumption city. To achieve that goal, Putuo is developing a batch of “landmark, radioactive, intelligent and comprehensive” shopping malls to gather headquarters of commerce industries and incorporate high technologies to shopping. Two robots, for instance, made their debut at the opening ceremony of the shopping festival on September 8 at the Global Harbor Mall, and served customers by guiding the route or relaying some basic information. The shopping and tourism economy has also been developing rapidly in recent years in Putuo. The district has had two five-star hotels, two four-star hotels and 75 travel agencies, including eight operating overseas travels. “The district has received 10.95 million tourists in 2016 with tourism revenue of about 3.3 billion yuan,” said Zhou. As of the end of July this year, Putuo has attracted 5.95 million tourists, a 6.2-percent increase on year. Tourists have spent a lot on food, accommodation, traffic, shopping and entertainment, which brings 1.8 billion yuan in revenue to the district by July this year, a 5.68-percent increase on year, according to the tourism bureau. Putuo has introduced many famous tourism brands to the Changfeng area in recent years, such as the Legoland Discovery Center, Joy City shopping mall and Shanghai Children’s Library. A lot of new attractions are on the way, such as a Hyatt Hotel project, a major renovation on the Joy City mall, an electric appliances museum of the Suning Group and an up-market Armara hotel from Singapore. “Upon completion, these new attractions will bring more highlights to the tourism industry of Putuo,” Zhou added.